Why can’t Americans just watch a good British television program? I learned that there is a Top Gear America, based on the world-famous Top Gear program produced by the BBC. Interestingly enough, the American version is being produced by the BBC and they are trying to push it onto network television. Why not just take the Top Gear produced in the UK and shown on BBC America? The hosts are hilarious, the show is entertaining, what is the problem? Is English with an English accent so hard to understand? I suppose when someone says “naught”, “Jaguar” or “zed”, is it just to difficult to understand? No powers of deduction? Non-native speakers of English in Malaysia watch the UK version with no issues, why is a Californiacation version of the show necessary? Is it that in the show the cars are left-side drive? They even use miles, miles-per-hour and imperial units! Oh well, I suppose it create jobs. After working all day I felt like traveling so I used my kitchen airplane and stopped off in Brazil for a meal. I was hungry from taking down the Christmas tree and decorations, cleaning up the apartment, and working non-stop from the morning trying to catch up and endless list of things that need to be done. I searched the “market” and I settled on a treat from the water today, some river trout for just $2.00…er…2.00 real??? 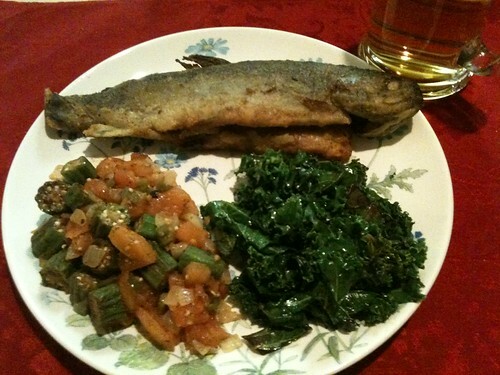 Peixe frito (fried fish marinated in lemon), tomate com quiabo (okra and tomatoes), and couve (sauteed kale), with a glass of Red Stripe beer on the side to go with the fish. I am not big on greens such as kale, so while I sauteed it I also add a few splashes of sriracha sauce to give it a little kick. A nice meal to mark the end of the day.